I wish to report that the music stream in your wonderful pub, The Falling Anvil, has not worked in quite some months. I have visited many times but alas, each time, only for a moment as the place is as quiet as a library…not the kind of thing a drinking man can put up with for long. It is so tantalizingly close, just a walk across the common from my Steampunk Explorer office in Tamrannoch. I dream that some day I shall enter and the music will play and I will sit and drink and sit and drink and sit and drink until the cows come home. Should you ever find a way to make the music play please do contact me as you will then have a regular customer. PS It is really just the music I long for, you need not acquire any cows. Thank you sir. I was not expecting to have a home here. But the city so appealed to me that I thought its place beyond the commonly accepted time period for the Victorian Steampunk era might lead to a new avenue of exploration. I have erected three buildings on my property here. The main house has seen better days. From the outside it looks a bit worn but it certainly is roomy after my expansion project. While it may not be the grandest home in town, it certainly is among the largest. I am quite happy with it as is. I have begun to furnish it, a task that is at times enjoyable and at others tedious. I am erecting an inside wall to separate the ground floor into two rooms. It has occurred to me that without that wall the space would be just perfect for a party with live entertainment. But when have I ever thrown a party? I must face the fact that this is simply a fantasy on my part and when I need fantasy I have Winterfell. (Ha! A joke at my own expense!) The wall will stay. The living room is appointed with the standard furniture as well as a writing desk, a table to place my wireless sets upon and wall hangings including a portrait of Bix Biederbecke over the fireplace. Should a passerby glance upon this portrait through the window they will know that this is the home of someone in tune with the music and history of these environs. Why one needs a fireplace in these southern climes is a good question but it does seem to “bring the room together” as I have heard said in a period about a century beyond the time in New Toulouse. As mentioned previously, the property itself is large enough for two other buildings. The Steampunk Explorer group will occupy one building. Mr. Steampunk has called it “an embassy of one time period to another.” Well put, I must say. Mr. Steampunk will likely have his private office on the 2nd floor. Up to now we have shared the private office on the top floor of the Port Laudanum building. Should we finalize this plan that spot will now be mine alone though he will have a need for it at times. I have given up the idea of a shop and will instead set aside the third building as a guest house for my friends to use when they visit. Seamus has already given his approval of the guest quarters and is planning a brief stay on his upcoming holiday. I look forward to exploring the area with him and catching up on his exploits since the relocation. I do not look forward to shopping for the furniture necessary to make his stay comfortable. On Sunday word spread of an “impromptu” in progress in Algiers parish, to the north of the city. From what I could gather an “impromptu” is a musical event that occurs, as the name states, without warning. Although I was pressed for time I decided I must get out and meet the locals in these parts or at least show my face. On my way a street car named Desire passed by. (I am not making this up.) While I was tempted to board the car I decided to leave that for another day. When I arrived in Algiers I wandered until hearing strains of exotic music, I followed these sounds to Madhu’s Cafe Indien. This is where the impromptu was taking place. Several local residents, including Prim Minister Riel, were dancing to Indian music which I believe the hostess said was from the 1960s, one of the most interesting decades musically (and otherwise) that I have visited in my travels. The hostess was Carter Denja, the owner of the establishment. Her coffeehouse features music from India and hosts a weekly presentation of world music on Monday evenings. I first heard this “world music” in the 1980s and then in successive decades and, though I am not well versed in it, have always found it to be quite enjoyable. What a pity it is that my schedule prevents me from attending in the evenings. But, as luck would have it, Ms. Denja switched from the 1960s Indian sounds to a preview of the following evening’s “mix.” I danced with the others and listened to the group conversation. They seemed a friendly and welcoming lot and, although it was certainly low key, I felt I had made my debut in these environs. It was reminiscent of my first dance at The Rabbit Hole or to the first of Miss Serra’s town meetings that I attended. 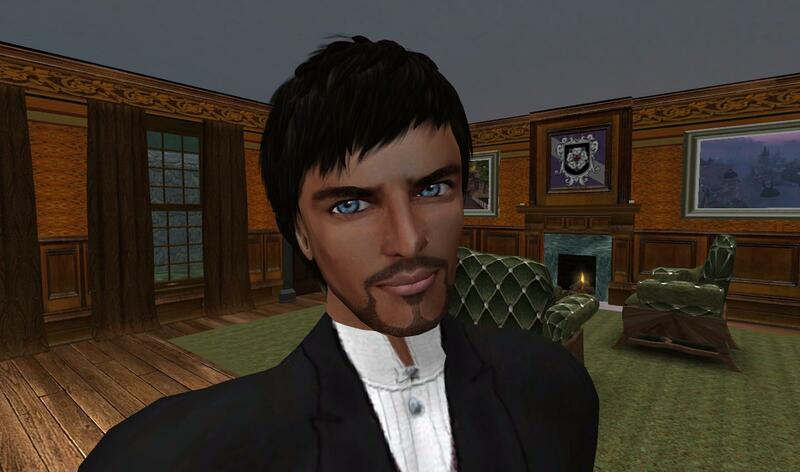 Now that I have sold off my remaining holdings on the Mainland (just last week) and opened six of the seven Steampunk Explorer offices we have planned for now, I can begin to settle in here in New Toulouse and continue to do so in Winterfell, Caledon and soon Austral. As Miss Macchi has chronicled, these settlings in do not happen quickly. They take time. Time is something I know quite a bit about. The day of the changes has come. I am writing from the upstairs bar at The Emerald Inn in Laudanum. It is a safe distance from the activity to the north. At least that is my hope. Mr. Steampunk is not here today and for this I am glad. He is the ultimate explorer and would have to place himself as close to the action as possible were he here. I, on the other hand, am a patient man (save for that first trip to Ravens Reach last spring) and can sit here and wait. It is the kind of day one shall not soon forget. There is definitely a buzz in the air as the changes take place. There appear to be more people than usual in the Winterfell lands today. Some must be watching, others waiting like me. The day began at my New Toulouse residence as work needed to be done there on the house. Next a quick stop in Caledon SouthEnd to check on the progress in the setting up of my new pub there. Then I came here to wait. Through the day I have checked the maps often. More than once today the map of Winterfell has changed, just as was foretold by the Seneschelf. What is not clear to me after five months of living and working in Winterfell is whether the Seneschelf’s power is the ability to see the future or whether she is the actual architect of the future. I realize this may sound far fetched to some but, in my experience as a time traveller, I have seen many things that sound incredible at first but turn out, in the end, to be true. I do not know if Miss Serra’s powers stretch beyond these lands but she certainly has powers here, whatever they are. There are other changes in the land as well. On a walk through Absinthe I saw new shops opening as well as a new embassy for New Toulouse, though it was in quite a state of disarray. Yesterday I spoke with Mr. Oddenfen. He told me of changes he has brought about at Miss Macchi’s estate in Reverie. I told him I had been meaning to take a trip up there to survey the grounds at the invitation of Miss Macchi. He asked that I postpone the trip for now. It seems that not everything is going as he had hoped. Although I am disappointed I shall, of course, honor his request. With all these changes about, this might not be the best time to be taking a trip across Winterfell anyway. His reports were now on my desk. Several telegrams, each more amazing than the last. Word had reached the office while I was away of beautiful woods and waterways along a mountain side. Boston had gone north to investigate. His final telegram said the mountain top was the shape of the head of a bird. It wasn’t known if this was a natural occurrence or if someone had constructed it. Constructed it? I laughed. Who could do that? How could it be done at all, never mind in a place no one had ever come across until now. It was a fool’s errand. This could not be a proper exploration but merely a scouting trip. By all rights I should have waited for Mr. Steampunk’s return and hear his whole story. Then we could mount a true expedition. At best, all I could do was to simply repeat the scouting work Mr. Steampunk had already done. But I could not wait. I was excited as a little boy at the circus. There was pristine land out there to explore! Land not even on the maps yet! But that wasn’t all of it. There was something else. Something was pushing me toward that mountain. I had to find a way there. Just as I was leaving the office a member of Steampunk Explorer arrived. He had heard a rumor that Miss Serra had headed north to claim newly discovered land for Winterfell and he had come in to see if it was true. “It’s news to me,” I said calmly, trying not to give myself away. At Steampunk Explorer we have a code that we share our information with anyone who wants it but until we verify a report, we say nothing. We are an information center, not a rumor mill. If Mr. Steampunk was here, he could tell what he saw first hand. But I have only these brief telegrams and no details. How would I explain the mystery of the mountain with the giant bird head? I bundled up and walked through the southern towns quickly to avoid being stopped by anyone. I did not want to be asked where I was going. I hadn’t explored Winterfell extensively yet so I wasn’t sure how to proceed without intruding upon someone’s land. I had gone about as far as I could through Anodyne wondering what I would do as I came to the water. Just a few meters from lands end I saw a rowboat in the harbor. A man was rowing vigorously. When he saw me he stopped and began waving. He was yelling something. Finally I could make it out. “Mr. Chairman! Mr. Chairman!” It was Boston Steampunk on his way back from his scouting expedition. I helped him ashore where he wasted not a moment before giving me an excited, breathless catalogue of all he had seen. What he told me only made me more determined to see for myself. “I must have your boat,” I said. “Sir?” “I am going north and I am going now.” “But, sir…” I brushed past him and stepped into the boat. “You go back to the office and make your report. Alert the officers and organize a proper expedition and, by all means, hire a proper sailing vessel.” I tossed his bags to him. “And send someone to me tomorrow with supplies.” I shoved off and left him there, mouth agape. I had known Boston Steampunk for some months now but had never spoken to him so sharply. What’s up with that? (Another phrase learned somewhere in my time travels, about 125 years to the future if memory serves.) I had been out of sorts all day. Now I was off on a long journey, ill-prepared and with little sleep. What was going on here? What was pushing me toward this faraway mountain with the raven’s head? Wait, was it pushing or was it pulling? I passed easily through Winterfell Harbor. The sun was shining but to no avail. It could not stop the cold. I rowed harder as I crossed into the waters of Illyria. It was then I first noticed there was water in the boat. “Darn you, Steampunk,” I said aloud, though only a seagull could hear me. My thought was of Mr. Steampunk trying to save money and get the best price but not the best boat. As I cursed him I shivered from the wind and began rowing for shore. Another boat approached from the east. “Ahoy sir,” called the voice of a man. He pulled closer and I could see he was very old but not as old as his boat. “Ahoy,” I said. “Looks like you need a hand. You’re taking water,” he said in a feint but raspy voice. “Yes sir, thank you,” I said as he pulled alongside. I carefully climbed from one rowboat to the other. His boat was ancient but more seaworthy than mine. I sat down next to a fishing pole. “Nothing to do but let her go down,” said the old fisherman as he looked at my boat. “I don’t think you’d have made it sir.” He pushed off from my boat and rowed away. “Where are you headed sir?” he asked. “Going north, sir, as far as I can,” I said without further explanation. “North?” He paused before repeating it quietly, “North?” He seemed to mull it over for a moment and then said it again, not as a question but as a statement. “North.” He waited for me to say more but I sat quietly and looked at the water. After awhile he said, “I’ll take you north sir. But,” he paused, “you will have to pay.” “I can sir,” I said. He continued, “I hate to take a man’s money after saving him from drowning but I have to eat.” He pointed to the empty bucket where his catch should be. “It was quiet out there today. Again,” he said. ‘I am most grateful for your help sir,’ I said. We discussed the price. We travelled into the northern waters of Illyria to the edge of the world as we knew it. Along the way the fisherman asked again where I was headed. If it was a secret, he told me, there was no need to worry. He had no one to tell. So I told him about my scouting expedition and of Mr. Steampunk’s reports. I don’t know if he believed it all but it seemed he had heard some of this before. “I will take you to the land if we can find it but I must be heading home before day’s end.” He looked as if he would be glad when that time arrived. Finally we neared land. The fisherman saw it first. “There she is!” he said as he pointed to tall trees along a shore. There was no mountain in sight but the sun had given way to clouds so there was no telling for sure. The wind picked up as we landed and it blew the cold right through me. “It will be dark soon so I will camp here for the night,” I said as I put my single bag down and handed him the agreed upon fee for his service. The fisherman looked at me with a weary smile, ‘You explorers have no fear, do you?” He paused and looked at the sky which seemed to be threatening rain. “Or is it common sense you lack?” I laughed out of courtesy, not bothering to determine if it was a joke or an insult. I had no time to worry about that. All I could think about was how to get to the mountain. The fisherman shoved off with a wish of good luck and a nod of his head. I gathered some brush and branches and made camp. The fire warmed the coffee while I unpacked my bread, meat and cheese. In the morning I again woke early. I finished the coffee I’d left the night before. I didn’t bother with a new fire, I drank it cold. I was in a hurry. Whatever force had brought me here was now pulling harder. As the dawn spread I could see most of the clouds had gone. I cleared the camp and packed my bag. I made my way through the trees to a clearing. And there it was, just above the remaining clouds. The bird’s head. It was true! I began to hike up the slope to try for a closer view. I came to a spot where the trees were fewer and I could look up from under the neck of this bird of rock. But I could not climb up as the rock was steep and I did not have the proper equipment or a team. So I walked back toward the water, looking for a spot from which to view the bird’s head in profile. When I found such a place I could not believe the magnificence of what I saw. It was remarkable. Such a stunning resemblance to a raven that no one could possibly deny it. For a moment I thought, “How did they do that?” But I wiped such a silly thought from my head. “They? !” I laughed out loud at myself. This could not have been done by an earthly being. I could only conclude that the raven’s head had been created by the same supreme power that created the rest of the mountain and the trees and the land and the water. Personal note…do not include the following in your official report…neither tell Mr. Steampunk of this for he may think you have gone mad…the force that drew me was so strong at times near the mountain that I could hardly breathe…but when I saw what I am about to describe, the pulling sensation ceased and I became calm and in a dreamlike state, which stayed with me for my remaining time in that land…the view from the spot near the waterway was difficult…but it looked as if the raven had eyes…from this distance the eyes looked purple in color…and they glowed. I must come back with a proper expedition team to verify. Later, additional lands were discovered to the east. At the Heritage Club the Tuesday luncheon series “Approaches to Community Service” featured guest speaker Mr. Danko Whitfield, the noted time traveler turned pub owner. The lecture committee has invited notables of various backgrounds to present their ideas on creating community involvement. Although Mr. Whitfield has retired from time travel he continues to seek new adventures as a co-owner of the Steampunk Explorer group. He talked of his hope that the group would make a contribution to the Victorian Steampunk community by helping old hands at Steampunk find new places to explore while introducing The Steamlands to new citizens and those whose interest has just begun. It was a packed house of ladies and gentlemen on Tuesday last, many of them hoping for the rare chance to ask Mr. Whitfield about his time travels during the question and answer but his speech remained on the topic at hand, community service. He told the audience that the American revolutionary, inventor and statesman Benjamin Franklin pursued a strategy of causing others to stand up from the crowd and take the lead of an issue. As much as Dr. Franklin has many achievements to his credit, Mr. Whitfield maintains that one of the greatest, which is often overlooked, was his ability to quietly create situations in which others would find themselves in a position of leading or pushing public opinion on a given issue. He said success on the issue was more important to Franklin than the accolades, although he was fond of those as well! Mr. Whitfield said Dr. Franklin realized that one person could not lead on every issue, there would be public resentment, jealousy and other impediments to a good idea not surviving the test. Following the event the most cordial Mr. Whitfield made himself available to this reporter for a brief interview on Dr. Franklin’s thinking. He said that while on some issues Dr. Franklin took the lead himself, whenever possible it was Franklin’s purposeful strategy to do the public good by planting the seeds and then letting others grow the idea, tending to it only as necessary and standing back whenever possible. The others would receive the applause for leading the charge but Franklin got what he wanted, the progress on the issue had been made and the old statesman was pleased to have had a hand in it even though the public had not noticed. “Are you going to answer my question?” your humble reporter asked. Mr. Whitfield continued to smile but said nothing. What a beautiful land this is! No matter how many times I traverse the environs of Winterfell, no matter how I travel – by foot, by water or by air, I am constantly amazed at how lovely this country is and at the work the Creator has given to those of us who live here. What a gift! The homes, the lighthouses, the statues, the trees, the waterways…the towns, the wilds. I can’t get enough! I had heard recently of changes to come in the land and I wanted to see it all one last time. So this evening I rode the ferry throughout the land – the whole route, a round trip. Boarding just down the street from my home at Port Laudanum, I was ready for a combination of thrills at the wonderful sights and the serenity and calm of a slow passage by water. I was not disappointed. I could have documented this trip, as any serious explorer should, and filed my report at the office. I saw Mr. Steampunk there just before I left. “What are your plans for the evening sir? If you’re not in a hurry, how about a pint at the Inn?” “No hurry Mr. Steampunk,” I replied, “but I must be off. I have a date with a beauty.” He laughed, “Enjoy your time sir.” I grinned at my misleading words. I didn’t want this evening to be an official trip. It wasn’t for others, it was for me. My date was with a beauty by the name of Winterfell. And I would not be in a hurry. I could tell you of the trip. I could describe the sights. I could relay a funny snippet of an overheard conversation along the way. But I won’t. This evening will stay with me. It will be a memory I will cherish. Even more so when the changes come. I am not worried about the changes. Whatever will be, will be. One thing I’m sure will not change is the essence of Winterfell. I will ride the ferry again in the future. I will take another round trip after the changes are done. I am sure that trip will be wonderous too. But it won’t be this one. This one will not be forgotten. Next door to me in Laudanum, there are people dancing at The Rabbit Hole. I sit here at my desk, writing. The Boston Symphony Orchestra is playing on my wireless. It is a live broadcast. As the music plays, I close my eyes and the images I have just seen on my ferry trip move through my mind once again. I returned from a holiday to find a mountain of reports on my desk. Okay then, maybe it was more a hill than a mountain. I do exaggerate a bit at times. But only over small things. Ha! I only exaggerate over small things. Good one! Following up on one of these reports upon my return from the seashore, I took a leap ahead in time – but just a few decades – to a place called New Toulouse. I had visited this city long ago but it had grown quite a bit in the interim. The prime minister of the land – or “prim minister” as the locals call her, is Gabrielle Riel. Yes, the same lady behind Radio Riel. I must say if you have not yet tried this new wireless device called radio, you are missing out on such fun and enjoyment. I suppose it may have other uses but in my travels around the steamlands and related territories I have found that most people use it to receive musical broadcasts such as those originated by Miss Riel’s company. One of my tasks on this mission was to begin to determine if the Steampunk Explorer group should place an office in New Toulouse or if it should be included in its listings at the other offices. It is not a Victorian Steampunk environment but it appears to have a similar audience. I found New Toulouse and its neighboring towns enchanting. In fact, I found it so inviting I spent a day looking for property for myself, and found something! I am setting up a house there. After a couple of years of having Mainland property but no house of my own, I now own a handful of parcels but have four homes! Two in Winterfell and one in Caledon, now add New Toulouse. I wasn’t planning on buying any more land for my personal use but I could not resist. The parcel is big enough that if Steampunk Explorer does decide to open an office there, I can host it for them as I do for most of our offices. Or I may put a small office there for a friend who needs one. Or start that shop I’ve been thinking about. I can fit two other small buildings on the property in addition to my house. At any rate, it will be another place to spend time and explore and to make new friends just as I have in Winterfell and Caledon. Yesterday we officially opened the first three offices of Steampunk Explorer. I spent the morning in the Winterfell Laudanum office and the afternoon at the Caledon Tamrannoch office. Last night I arrived here at the Austral office. At each I met with visitors and members of the group who came in on Day One. It was nice to see the interest. As for Austral itself, my gosh this small nation has burst with energy! The difference from a week ago, before my holiday, and today is astounding. The view from my office windows is superb. I can see the clock tower – it looked magnificent last night. I can see pretty yellow trees to my right and to my left the southern docks of the East Zindra shipping company. I took a quick survey of the entire island last night and there is building going on everywhere. A report reached me here last night of changes in the air (and in the land and waters) back in Winterfell. I must take some time for a final tour of some places that, good authority has it, will soon vanish. It is hard to believe a report like that except for the knowledge that such things have happened before. No matter how things change, Winterfell goes on. The last day of the week has also been a busy one. After office duty today in Austral, I took the late afternoon off to attend the Miss Caledon final at the Gaiety Theatre. It was quite the show! My schedule in that other world is such that I don’t get to many events like this. Such a good time. Just jotting this down after returning from the wedding reception of Mr. Alix Stoanes, Governor-General of Austral and citizen of Caledon and Winterfell and his new spouse, Mr. Sustani. It was a great party! Much dancing and champagne. Off to bed now. Another full day tomorrow.